teacher – Literacy Changes Everything! Dear Reader: Below you will find what I consider to be a battle hymn, written by my brilliant friend and teaching colleague Katy Ramón. It may surprise you to know that Katy does not consider herself a poet, and, while she doesn’t publish her poems often, I am always love when she does. This poem gave me hope and strength in the days after the election, yet it is also a cry for deep personal examination. Last week was a difficult one in our schools, and Katy’s poem shows the warrior strength that so many educators possess and display in a time of turmoil for our students of color. That some of you can scroll on, that some of you won’t understand, that some of you will be angered and confused, that some of you won’t care, is heartbreaking. I don’t need you to comment with acceptance. I don’t need you to comment with dissent. Let it marinate and digest it as you will. This is my story. To hug and comfort crying and fearful children at school and at home was heartbreaking and took EVERY OUNCE OF MY STRENGTH. To hug and comfort grown adults, was heartbreaking. I refuse to pay a dime for cable, and I always have been that way. But I read. I read transcripts, quotations, and opinions from various sources. From there I form my opinions. I believe that a person is directly responsible for the words that come out of their mouths. A person is directly responsible for their actions, as actions and words are the expression of their ideas. If you support a person that has proved through quotes and documented action that he is a bigot, then you also, sadly, are part of the bigotry. To realize that a huge portion of my country does not respect women, including myself, my daughter, my sisters, and my mother, is heartbreaking. To realize that a huge portion of my country does not respect Mexican ancestry, including myself, my father, my family, my children, my students, is heartbreaking. To realize that a huge portion of my country does not respect black people, including my son, my friends, and my students, is heartbreaking. To realize that a huge portion of my country does not respect people with different sexual identities, including my family members, my friends, and my students, is heartbreaking. To realize that a huge portion of my country, including family members and long time friends, hold a bigoted world view, is heartbreaking. If you find yourself aligning with intolerance, go get to know people that are not like you. Expand your world view. It is courageous to identify your own personal ignorance and work toward understanding. I will look into my own as well. In the meantime, I will dedicate every day to education, understanding, and tolerance. Katy Ramón teaches middle school mathematics and Algebra 1 at the Gardner Pilot Academy K-8 in the Boston Public Schools. She holds a graduate Certificate in Educational Leadership from Boston University, Boston. Katy holds a Masters in Education and is a graduate of the Boston Teacher Residency program, University of Massachusetts, Boston. Katy also holds a Bachelor of Arts in Economics and Political Science from the University of Washington, Seattle. Author Mae Claire is as multi-faceted as the island of Hispaniola itself. A Haitian orphan, Mae was adopted by Christian missionaries and raised on the Dominican Republic’s North Coast. After attending college in the United States, she returned to the Dominican Republic to teach history and English at an international school. Mae has also become a mother to three adopted children, and, in 2012, she met her partner, Mary. So, is Mae Haitian? Dominican? American? Black? Polyglot? Mother? Lesbian? Christian? Atheist? One thing is certain – Mae Claire is not easily categorized. Mae Clair has written several novels and memoirs, including Jogging to Hell, What Part of Me Is Saved?, and Larimar. Her books are available through her shop on lulu.com. In this exclusive interview, Mae discusses her 2010 young adult novel P.S. 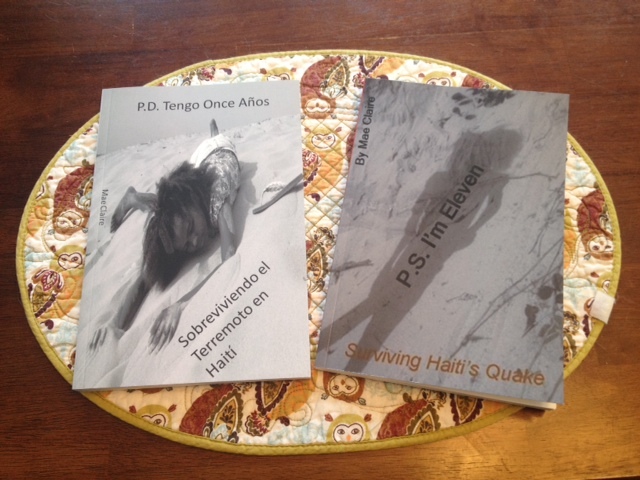 I’m Eleven: Surviving Haiti’s Quake. P.S. I’m Eleven is written in English, yet the narrative is certainly not an American style. Would you say the book is set up as a diary or does it follow a narrative pattern particular to the Caribbean? This book is written in the form of a diary as I traveled to the border of Haiti and jotted down my observations. At some point in the book, when [the narrator] Antoinette is in school, she says that she is writing down everything that happens to her, and that one day she hopes to get it published. Antoinette’s narration assumes that the reader is quite privileged for being in possession of a book. How do you see reading as a privilege? Do you think reading is a right? 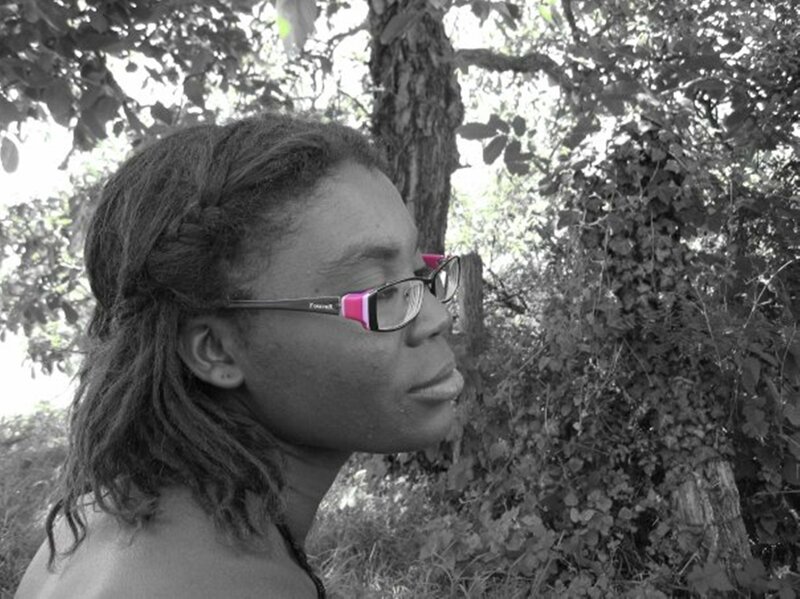 It is miles and miles to get to a source of education for Antoinette and her best friend. The assumption is that if you have a book, you have the means to get it whether it being via car, bicycle, or horse. In Haiti, checking out books is not a familiar concept. People read the books in the building. I went to visit my oldest daughter in college in August, and I noticed that the facilities are wonderful. I stepped into the library, and it was huge, all air-conditioned and fancy with wireless internet, desks, and everything the kids could ever want. But books? They were behind the circulation desk and were rarely permitted out of the building. Books are sacred, and only privileged people get to read them. So for [Antoinette], having a book means you are either privileged, or, the concept of book-keeping is quite different. I currently teach 4 year old underprivileged children. Every morning, my routine includes reading a book. My [students] are fascinated by them. [One of the students] does not have any books in her house. When she comes to [my tutoring center] though, she is surrounded by books. Books are also super expensive, and there is usually only one copy of each, so to lose them would be a tragedy. One book would cost about 800 pesos ($23.50 in U.S. Dollars). I sell P.S.I’m Eleven for about 450 pesos ($13.25 US) and people don’t even dish out the money. The book is full of religious imagery – mostly Christian. However, when the Haitian women are burying dead from the earthquake, a polytheistic chanting ritual is performed. I have read that Catholicism is the more official religion of Hispaniola, but what other religious practices exist on the island? Are non-Catholic or Christian practices considered taboo? How do missionaries influence the religious practices of Hispaniola’s residents? I think I have infused a lot of my personality and vision into Antoinette’s character, and this is where Christianity has become part of the imagery. I imagine myself in Antoinette’s position. If I had not been adopted at such a young age, I could see myself being her, being all of her. Religious taboos are not really part of Haiti; if anything, the religions are a mix of everything and anything. They contact the gods, wherever the gods are, at any time, and in any situation. If the Christian God shows himself, then they talk to Him or Her. If the Buddhist God shows up, then that is who they work with. There seems to be little to no discrimination when it comes to their gods. Missionaries have really created a discriminative perspective on spirituality as they claim that only Jesus can give you life to the fullest. But we know this not to be the truth, as there are many people groups and religious groups experiencing life to its fullest in a much larger spectrum. Missionaries have taught the people of the Hispanola to hate, judge, and discriminate against their own people. Christianity has not taught them to love one another unconditionally, but only to accept one another under certain conditions. Missionaries are the ivory of the ages. They offer food, drink, clothing, and health, and then open up their agenda book. They provide the physiological needs to later say “I told you so”. What is your writing process like from the start of to the completion of a book? How do you plan your books? Do you have a writing routine? My writing process has evolved greatly. As an English teacher, I use writers’ workshop to teach my students how to create a good plan, complete the first draft, work on the second, revise, then edit with a teacher, and then, finally create the publishable draft. But the more I think of that process, the more I realize that not everyone thinks in such a sequence. It is a good idea in theory, but not in life. For me, i always start with an idea, and i build my writing around that one idea. The book I am currently writing, Gracias A Dios, is based on people’s opinions about a God who helps some and not others. I am using my experience and that of other people to formulate and finally create the book. I used to begin by starting at the beginning. But now, like in P.S. I’m Eleven, I at times start at the end. Sometimes you need to know what happens at the end to be able to create a wonderful beginning, middle and refined end. You seem very in tune with the mind of an eleven-year-old. The book’s narration seems extremely authentic as Antoinette has many understandings of the world, but she still seeks guidance from adults. How did you find Antoinette’s voice? Did anyone in particular inspire you to develop her character? Before writing the book, I made a trip to Haiti’s border and spent time helping in a triage two days after the earthquake. I watched and listened and learned. I spoke with kids, around the age of 11. I then documented what i saw, felt, touched, and heard. I came home and then I worked with [cover model] Rocheyli in the summer. Rocheyli is part of the Mariposa Foundation. I spent time with her, at her house, with her family and got an idea of what she wanted in life. I found her character similar to my personality, and the character and voice I wanted for this narrative. I also considered this to be a book I wrote for my 6th grade students at the time. There was one student in particular who reminded me of Antoinette, and so I expounded on that. In short, three to five different kids influenced my writing and making of this character. P.S. I’m Eleven addresses many topics that are normally taboo in young adult novels: perversion, menstruation, molestation, and lesbianism. Yet, these topics are extremely relevant to the lives of young people. Do you think it is an author’s responsibility to lift taboos? What prompted you to address these ideas through Antoinette’s character? Taboo is a big word, especially when it comes to children and education. No one wants to step on people’s toes. But, I believe that taboos need to be lifted via pen and paper. If kids are reading it, parents can’t necessarily claim that a teacher has “said” this or “said” that. Alice Seabold’s Lovely Bones is a prime example of topics that are really poignant. My book was not openly welcome even in my school as the principal was afraid to answer questions if parents were to ask. But it is in their library, so kids can choose to pick it up if they please. These topics need to be discussed because children go through these things that are so relevant in their lives. In public schools, kids are dealing with all these topics and more. In private conservative homes, kids are dealing with these topics and more. So sometimes, if a child can read about it, and realize that the main character made it through, they may also acquire the hope that they too will survive. I wanted to address these ideas because i can’t leave them out. If I’m writing about Haiti and poor kids, then the need to include it – it goes hand in hand. I want my book to encourage kids to ask questions. And hopefully, there is someone who can answer them. How does the impact of the 2010 earthquake still affect Hispaniola today? Kids are still homeless, parentless, motionless. No jobs, no money, more prostitution. More fear. Harder to adopt due to new rules, fewer buildings, but a new sense of hope, faith, love. 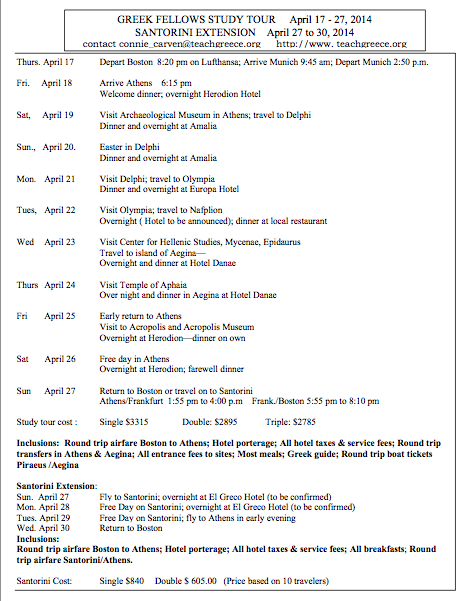 I want YOU to travel to Greece this April! In the Spring of 2012, I participated in an amazing program called The Examined Life: Greek Studies in Schools. There were two parts to the program. First, I participated in an online course which required me to read the literature of Ancient Greece, including The Iliad, The Odyssey, and several plays and short works. The course also included discussions of the literature in an online forum. Additionally, this trip had a significant impact on my teaching practice. In grappling with challenging texts, I was able to not only empathize with my students who struggle with grade-level reading materials, but I was able to share my “Reader’s Notebook” from the course with my students and have them try out some of my reading strategies. I remember my students being very impressed by all the notes I had taken, and I shared with them that reading is a lifelong process. Furthermore, I grew in my level of comfort in presenting students with Greek traditional literature because I am able to understand the cultural and historical context of these stories better and provide more adequate and accurate background knowledge. The good news is that now YOU can participate in this incredible journey! Great opportunity — and the experience of a lifetime! N = 1: Are We Serving the Student in Front of Us? Last night was the first night of my Reading Diagnostics class at MGH Institute of Health Professions, where I am a student in the Reading Specialist program. Our professor presented a fascinating concept to us: N = 1. She said that, when teachers complete academic assessments and instructional plans with a student who we are serving, the sample size is 1. Just 1. Although researchers utilize larger sample sizes to study trends among groups, those who directly serve children must focus on serving each individual student in the classroom or clinical setting. This means that, although some classroom techniques or clinical practices may serve most students, it really only matters if the services provided to a student work for that particular individual. She likened the practice to doctors selecting a medicine for a particular patient. Just because a certain type of prescription works for most patients does not mean that the particular medicine will work for the one patient who we must consider as an individual entity, in and of himself or herself. N=1 makes me feel validated in my approach to students. I have difficulty examining trends in data about my students – I prefer to take the time to look at each child individually. I applaud success, and I become very concerned if a child is not thriving, even for a moment on a particular day. I analyze the many factors involved, and I often follow up with a conversation with that student. Did you eat breakfast? Lunch? Did you sleep last night? Did something happen in the hallway? the bathroom? in homeroom? Did you understand the directions? How do you feel? Did the lesson make sense to you? I have learned that I cannot assume. There are many reasons for students to have a “bad day” or a “bad class” at school. My job is to optimize the classroom factors I can control at school for that student and to let the student know that I will never give up on him or her no matter what. Who cares if something works for most students? Different things will work for each and every child in front of us, and we need to take an individualized approach to provide a bridge to progress and growth.